The best promotional products are items that are useful, desirable, well designed, and made with high quality materials. That’s why a tote bag is a very intelligent selection for your next promotional marketing campaign. These are products that can make an impact in the lives of your ideal customers from the very first day that they receive them. Promotional tote bags are also universally desirable, and allow you to increase recognition for your brand or business with ease. Below, you will find 5 compelling reasons why you should promote your brand with totes. Tote bags make great promotional products because they are universally appealing. They aren’t gender or age specific, which means giving out promotional tote bags during your next promotional marketing campaign won’t require you to cater to a specific demographic. You can design the perfect tote bag to spread your brand and rest assured that the recipients will be able to use the product. A great option for choosing a tote bag from promotional purposes is iPromo’s 20 x 15 x 5 Convention Tote. This bag is made from recycled material, has a large item capacity, and is a great budget friendly option for your next promotional marketing campaign. Bags like the 20 x 15 x 5 Convention tote are universally appealing and will certainly be well received! Another great reason why you should go with tote bags for your next promotional marketing campaign is that totes provide a lot of customization options. There are so many different sizes, materials, price points, and features to choose from that you are certain to find the perfect promotional product to match your unique marketing goals. For example, this Non-Woven Two-Tone Grocery Tote is a fantastic choice if you are seeking a classic design that can be used at conventions as well as at the grocery store. Your artwork is permanently applied to these bags using a precision printing press to create striking visual appeal. This bag has an intriguing two-tone color scheme, is constructed of 80 GSM non-woven polypropylene, and has a removable bottom insert. 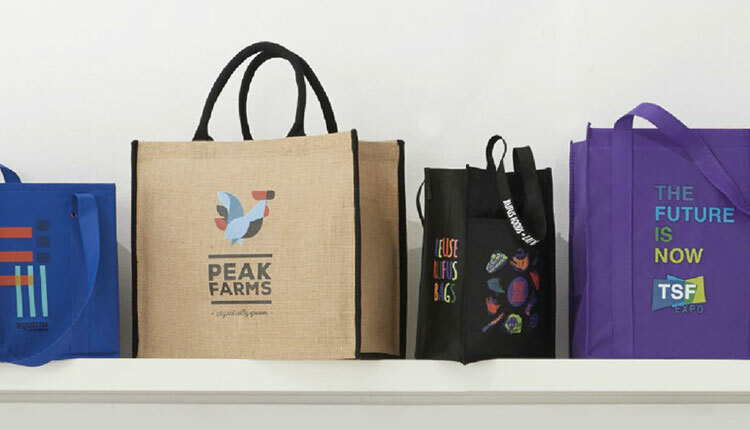 A great feature of choosing a tote bag for your next promotional product offering is the fact that these bags encourage environmentally friendly values. Instead of using plastic grocery bags every time you go shopping at the supermarket, you can bring your tote bags instead! This helps to reduce an individual’s ecological footprint. Cities and states are eliminating the use of plastic bags as well, which means that totes will become more prominent in the very near future. This Cork Tote is a unique option in the tote bag world, since it is made entirely from cork materials. It’s an original and eye-catching tote bag that can certainly attract positive attention to your business or brand. Tote bags are usually fairly large and have big decoration areas for you to advertise your brand name, logo, or business on the side of the bag. As we mentioned before, there are so many different eye-catching options to choose from in the tote bag world. The more aesthetically appealing your promotional product is, the more eyes you will have on your logo or message. iPromo’s Color Pop Convention Tote is a great way to have your brand stick out at the next convention. The design is simple, but the color schemes seem to have a way of popping out and attracting attention. Did you know that bags generate more impressions than any other promotional product? That means that customized promotional tote bags are constantly helping you spread the word and build hype around your business or brand. You can’t go wrong with a tote bag like the Cameron Convention Tote With USB Port. This bag provides a sleek modern design with technology integration in the form of a USB. It includes a side water bottle pocket, adjustable shoulder strap, and a convenient USB charging port that allows you to charge your technology items on the go. This type of bag will definitely help you get your business noticed. All of iPromo’s bags mentioned above can be individually customized to meet your own marketing vision. We have one of the largest collections of promotional tote bags to choose from on the internet. Check out our website or contact us today if you’d like to explore more tote choices!